Learn the Ankle and Subtalar (Double) Fusion using OrthoSolutions Oxbridge nail surgical technique with step by step instructions on OrthOracle. Our e-learning platform contains high resolution images and a certified CME of the Ankle and Subtalar (Double) Fusion using OrthoSolutions Oxbridge nail surgical procedure. Double fusion of the ankle can be performed using intramedullary fixation using the OrthoSolutions Oxbridge Nail. This is a method applicable when both the ankle and subtalar joints are to be fused,which achieves rigid fixation, even in cases of bone loss. 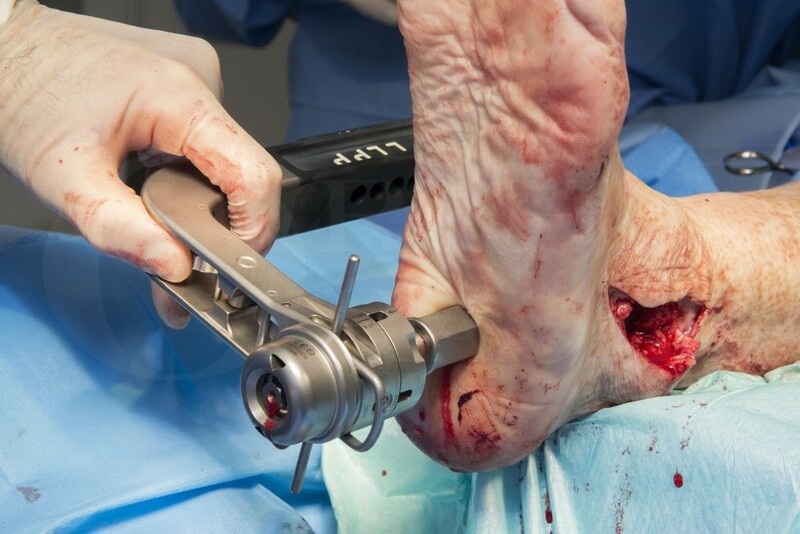 Particular advantages of the Orthosolutions Oxbridge nail are a well designed entry jig to assist centring the initial guide-wire , numerous distal screw option to secure the nail into Calcaneus and Talus coupled with a simple & accurate outrigger to allow lateral , medial and posterior positioning ,multiple synchronous external compression options , a “Mis-a-nail” jig to allow easy placement of a supplementary large screw to improve rotational stability and axial compression for the difficult reconstruction cases and a single , simple tray of instrumentation. Institution : The Nuffield Orthopaedic centre, Oxford ,UK.